Where do I begin… let’s just say that pre dot-com boom, Silicon Valley was not the food mecca it claims to be today, especially in terms of Italian food. Now you must understand, we were coming from a New Jersey suburb with easy access to New York City, so our expectations were high. We took New York pizza joints and corner family run stores where you could grab a slice or a pepper and egg sandwich for granted. In the early days, Mio Marito and I visited every local pizza place possible in search of something remotely familiar to what we were accustomed to. Every so often a fellow transplant from the New York metropolitan area would suggest a spot where the pizza vaguely resembled that of the old country – the East Coast. Yes there were a few contenders, but honestly nothing compared to John’s in the Village or the Reservoir in Boonton. We were determined and in our humble rental home with it’s basic oven devised a recipe and system that eventually resulted in a rather exceptional New York style pizza (yes, a future post, stay tuned). Fast forward to two homes later, some unused garden space and a newfound obsession for Neapolitan style pizza. Mio Marito decides that we need an outdoor pizza oven, or un forno. Of course I was totally on board, but I must give credit where credit is due – totally his baby. Well, I have always said – Mio Marito works incredibly hard, a faithful hubby, awesome father, does not gamble, ok he does drink too much wine at times but that’s not so terrible – why shouldn’t he have an outdoor oven? We totally embraced the idea and located an importer who specialized in clay oven inserts from the Tuscany countryside that are AVPN (Associazione Verace Pizza Napoletana – Neapolitan Pizza) approved. This was the easy part and honestly the least expensive; these babies are heavy and require significant masonry work. 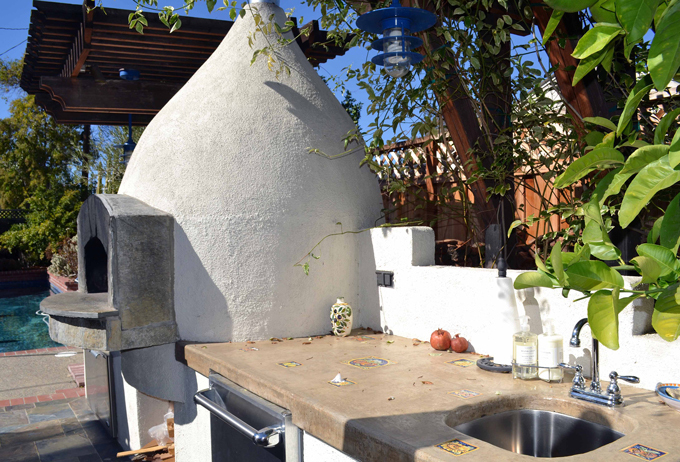 Once we started working with a contractor the project morphed into an outdoor kitchen. Earlier that year while in Italy, we selected and hand carried ceramic tiles from Tropea Calabria to set into the concrete countertops as a reminder of our family gatherings on the Tyrrhenian shore. Mio Marito is the keeper of the flame, a most crucial role as controlling the heat inside is essential to the cooking process. As a family we have prepared countless pizze, fresh roasted fish, vegetables from the garden, slow cooked cannellini beans, and of course the Thanksgiving turkey. The resulting dishes are extraordinary, the smoke that the almond wood produces imparts a flavor to the food that cannot be had from a conventional oven. Il forno calls even the most timid guest around the fire especially when it is time to make pizza. During the rainy winter months, many a Sunday evening has been spent with the three of us huddled together warming ourselves by the fire while waiting 90 seconds for our pizza to be skillfully drawn from the blazing oven, only to be immediately devoured until the next one appeared – crisp and bubbling. It has been seven years and il forno has been the centerpiece of more special gatherings than I can count. Bringing together our family and wonderful friends in a communal way reminiscent of old world Italy. That is the journey so far, stay tuned for more “Tales of Il Forno” along with recipes that can easily be adapted to the conventional oven. I love this post, it makes me want to rip up my yard! What a perfect spot for entertaining. I can’t even imagine how delicious a turkey must taste in there! Thank you Marie…the turkey is fantastic – I was hesitant to start the job at first as well, but it has been so worth it. Have a wonderful Thanksgiving with your loved ones.